Morocco is renowned worldwide for its beautiful handcrafted ceramics. Following ancient techniques, ceramic artisans throughout Morocco transform clay into visually stunning works of art with their geometric Zellij decorations (enamelled mosaic tile work), ornately painted bowls, urns and tagines, some embellished with silver and brass metal work, tiles etched with lavish calligraphy and of course many more modest pieces intended for everyday practical household kitchen use. 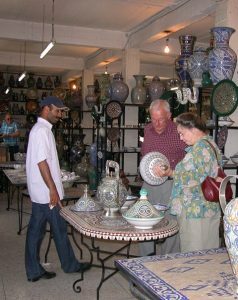 If you are researching your Morocco travel ideas or have an interest in Moroccan ceramics you may already be familiar with some of the country’s ceramic centres you may wish to include in your Morocco travel plans. Fez tends to be the most widely known ceramic production centre – particularly for its classic blue and white patterned ceramic designs. 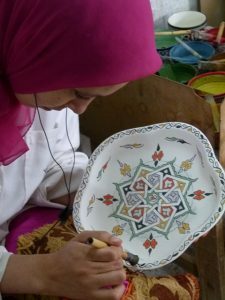 Safi may not be familiar to as many people by name but if you have seen Moroccan ceramics you will probably recognise the colourful ceramic glazes favoured by the Safi artisans – such as bright yellows, rich reds and lush greens. If you have already heard of somewhere such as tiny little Tamgroute with its strikingly unique metallic green glaze you are likely a collector, an avid potter or Moroccan crafts’ enthusiast. 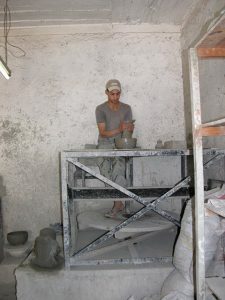 Typically Morocco’s ceramic artisans work in local collectives comprised of specialist artisans, including master potters, painters, glaziers, zellij master craftsmen, kiln masters and etchers, each of whom has a unique roll to fulfil in the different stages of ceramic manufacture. 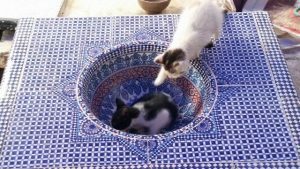 Including a visit to one of these collectives in your Morocco travel itinerary will certainly give you an appreciation of the days of painstaking precision craftsmanship and skill put into each individual handcrafted ceramic piece – it is remarkable. Many of our Berber Treasures Morocco tours small group tours of Morocco include a day tour of Fez which visits one of the local Fez ceramics collectives (CE1, CE2, CE9, CE10, CE12) and some also travel to Tamgroute to visit the charmingly small ceramic collective there and the impressive Koranic library. 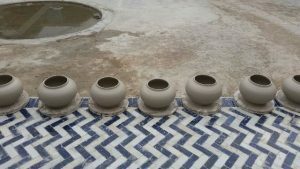 Our bespoke customised private tours of Morocco can be tailored to include tours of Fez ‘ceramic collectives, Safi, Tamgroute and other Moroccan ceramic centres. 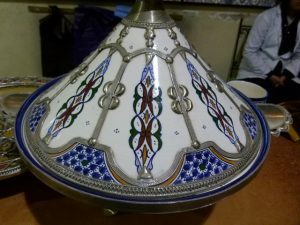 Email or call us now to discuss how best to explore the history, culture and craftsmanship of Morocco’s marvellous ceramics on your Berber Treasures Morocco Tours itinerary.